Eli Crane, who is a former U.S. Navy SEAL, turned his hobby of making bottle openers out of spent ammunition casings into a successful business. At first, he just made them by hand for his buddies. Eventually, he and his wife decided to make a business of it. As entrepreneurs, they watched a lot of Shark Tank and decided to apply. Not only did they get accepted, they got a deal from Mark Cuban and Mr. Wonderful. After Shark Tank, sales went from $7,500/month to $22,500/month. Eli knew he needed to have control of manufacturing to keep up with demand and delivery deadlines to keep the business growing and profitable. He started researching CNC machines and evaluated many different brands. "But I noticed when guys talked about the Hurco, they always said they were solid, hardworking, workhorse machines that were easy to use." Eli contacted our distributor in Arizona, D&R Machinery, and that's how Hurco and Bottle Breacher got connected. It was such a great story, we knew we had to make a trip to Arizona to feature Eli and his team for our next video case study. 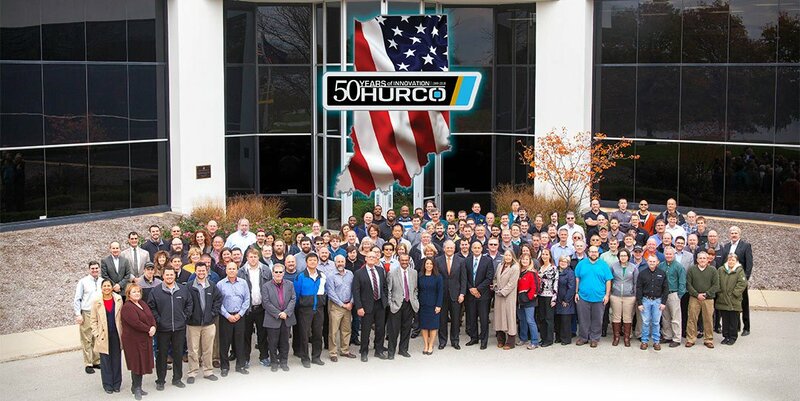 Here at Hurco, we've been planning for the 50th Anniversary for quite some time. For our standard giveaways (Hurco swag), we settled on a simple redesign of the hats, shirts, pens, etc., but for the VIP gift, we knew we wanted it to be a special. Even more important, we wanted the gift to be made on a Hurco by a Hurco customer. When we connected with Bottle Breacher, we knew we hit a home run. [Video] Eli Crane of Bottle Breacher Announces the Winners of the Final Pre-IMTS Bottle Breacher Drawing. Click here, for the winners from the IMTS drawing. P.S.A Bottle Breacher is one of those special gifts that is both unique and useful. Check out their selection at www.bottlebreacher.com Not only is it a cool gift, it's made on a Hurco by a veteran-owned company. We received so many appreciative emails from the winners, which was really fun for us! However, the most creative award goes to Matt at RPM Tool! Check out his photo submission here.